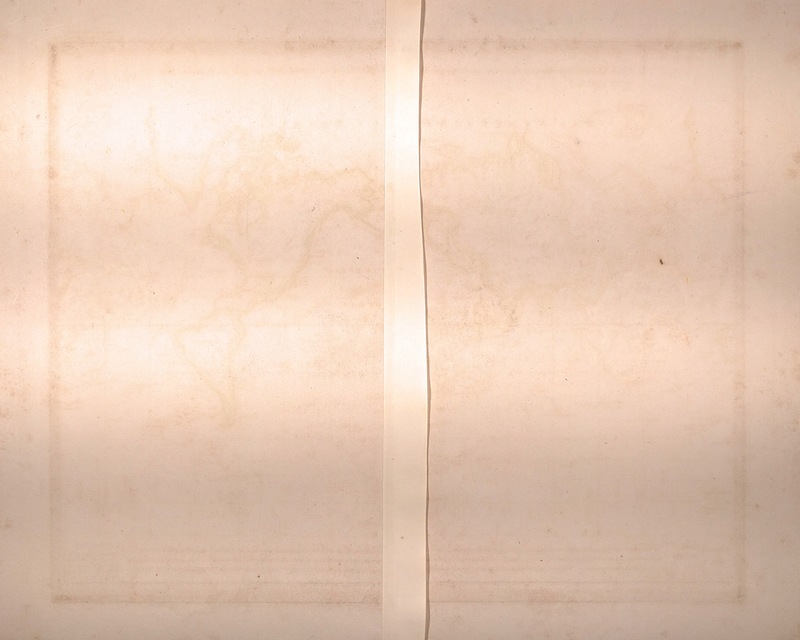 Antique maps are, with some exceptions, inks on substrates. The substrate, usually paper, will be covered in a separate post as there is plenty to say about it. This post focuses on that which has the power to change an ordinary piece of paper into a stunning map: inks. Inks bring out the engraved lines as fine as a hair, highlight political divisions, and add the whimsical pop of color to a sea monster. An ink is the sum of two parts, a vehicle and a colorant. A vehicle, usually a liquid, physically carries the colorant, which is the compound that provides the desired color. A colorant can be either a pigment, meaning tiny particles of colorant suspended in the vehicle, or dyes dissolved in the vehicle. The earliest inks, developed some 4500 years ago, were pigment based, composed of water, soot, and a stabilizer like egg white. But my they’ve developed since then! Modern and what I’ll term recent (within the last couple hundred years) have advanced to include a variety of colorants, and frequently use additives such as humectants, pH buffers, and resins, among others, each conveying different properties upon the ink. 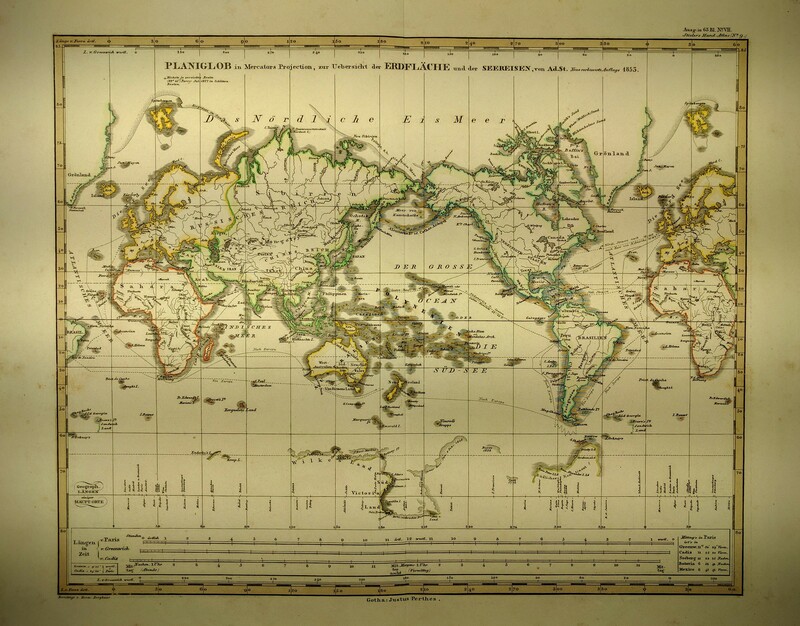 Understanding the ink on a map can tell us a lot about the map’s age, purpose, and cost. Analytical chemistry is a field that uses lab techniques to identify unknown compounds. Their methods are usually destructive, such as burning the subject compound to see the color emitted or to look at the temperature at which it combusts, dissolving it in solvents, etc. While this is the opposite of what a map collector wants to do, thinking like an analytical chemist offers a great way to approach understanding inks. Inks usually go through changes as they age. Aging usually imparts a faded or discolored appearance. Iron based inks, common in recent, but not modern, fountain pen ink, oxidize into muddy tones. The colorants in some inks, particularly dyes, fade as light and other factors break down the complex molecules which yield the colors. This aging process lets us approximate the time of printing or coloring. 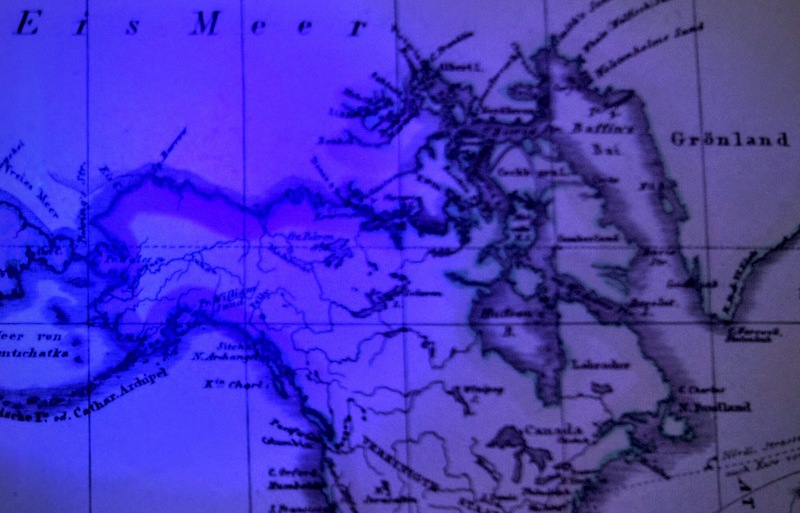 In doing so, we can find clues to a identify maps with new color and reproduction maps (note that reputable map dealers look for authenticity and disclose when a map has new color, is a reproduction, facsimile, etc.). Whether an ink fluoresces under UV light is another useful piece of information in determining what ink was used and when. Chemicals that fluoresce under UV light do so because they convert beams of invisible UV light to a visible color (although other beams can cause fluorescence). Some pigments take on brilliant glows when illuminated with UV, for example alizarin red appears bright pink. That a compound fluoresces at all, and the color it shows, are clues to identifying the pigments or dyes. By the way, iron inks that have faded will appear under UV light. Oxidation occurs when chemicals react with oxygen in the air (occasionally another compound can act as the electron acceptor, but that is beyond the scope of this article), forming new compounds. This is important in the fading of some inks and their affect on the paper under them. For example, certain green colorants will oxidize the paper, turning it a darker shade, and eventually changing the color of the ink itself to brown. By understanding the types of colorants used, the period in which a piece was produced, and how it was produced, we gain a lot of insight into the history of the map. Perhaps the map is an early piece with meticulously applied brilliant color or maybe a piece of recent origin with pastel colors applied with little regard for precision. These tell us that the first piece was intended to have decorative value, was colored by an artisan, probably colored later and was likely expensive. On the other hand, the latter map would likely have been colored by a child in an almost factory like environment, for utilitarian purposes, and relatively inexpensive. Were the inks rare? If so, its value would only go up. With alchemy maturing into modern chemistry, new and cheaper colorants were available by the end of the Enlightenment meaning more colored maps. Interestingly, by the later part of the 19th century the economics of paper production, that is to say mechanization and the switch from rag to wood pulp, brought coloration to what would have been uncolored maps. Where coloring a map would have been prohibitively expensive, a publisher using machine made wood pulp paper could afford to color the maps. This was full of good information, and could be the stepping off point for all sorts of further explorations of paper, ink, aging, verification of provenance, and changes in map making methods over time. Lovely illustrations, too. Thanks for the good word Ran! I couldn’t agree more. I think a production techniques post is in order.